DocuWare is an international company and technology innovator with a long history of achieving industry firsts. Our customers’ expectations of Software Support are high. My team and I do our best to not only meet these expectations but to exceed them. When I first started programming and supporting software some 29 years ago, one thing became apparent to me quite quickly. That is, if you do not know where you are in solving the problem, then chances are you will not solve it – unless you get lucky. In the same way that a cave explorer runs a string line as they progress in the cave in order to be able to find their way out again, a good support technician will do the same thing in a virtual sense. In that way we always know where we are in the maze of information and can easily backtrack when we run in to a dead end. Software problem solving is as much of an art form as it is a skill. You learn a great deal very quickly as you become familiar with the software, and fortunately problems tend to repeat themselves making providing the solution easier. But there are always the difficult problems that require you to tap in to your skills and experience in order to find the right solution. To build on the skills and experience that the support team has, each year DocuWare holds a workshop where we get away from the office and work together to explore the different problems we face and find more effective ways of solving them. Everyone comes away from these workshops with a bit more knowledge, a sharper skillset and more confidence that ultimately benefits our customers by providing them with better service and satisfactory solutions to their problems. A customer’s expectations of the nature of the software support they will receive should be based on a clear set of guidelines to ensure a high level of customer satisfaction. Our fact sheet What does DocuWare Americas support provide? outlines what we offer. Two support avenues mentioned in the fact sheet are customer forums and our FAQ site. 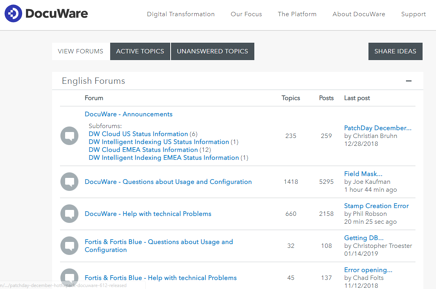 Forum topics range from how to configure DocuWare in a certain way, to workflow design, solving specific problems and programming techniques. With over 800 active forum users from around the world you can be sure that someone will have an answer for you. The DocuWare Software Support team moderates the forums and provides additional input. You can also share your thoughts on improvements to the software. Your input will be factored in when a software company, like ours, considers product enhancements and new features. Subscribing to the forums provides the benefit of being notified whenever we issue a Hot Fix pack or software update. Consider upgrading to the most recent software version. While most companies support previous software versions for some time, they support a limited number of prior releases. Upgrade to the latest version also enables your organization to take advantage of new software modules which may require you to be using the latest version. When searching the FAQ’s, use keywords to keep the search relevant. Let’s say you have a DocuWare service that will not start. Entering just the service name will return every article having to do with that service. To make the search more relevant, try entering the service name and then a keyword. Thumbnail server will not start. This will return all articles with “thumbnail” and “start” in the title first, and then all articles with the word start after that. This is helpful as the most relevant articles are shown first. The Forums are a hive of activity. There you can gain the benefit of the experience and knowledge of other customers as well as DocuWare support staff. A successful software support call requires a dialogue between you and a support team member. 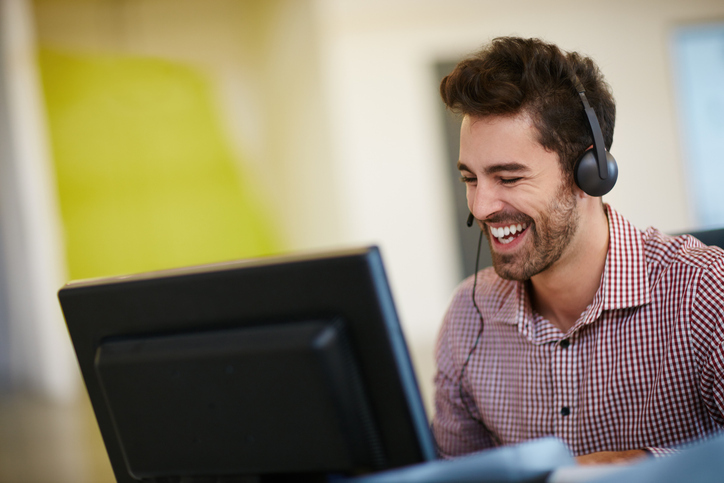 These tips will help you make every exchange with software support more productive. Make sure you’ve gathered as much information as you can before you submit a Software Support request to help support resolve your issue quickly. If an error message is displayed get a screen capture of it or take notes about what the error message said. When possible, tell software support what process you were involved in at the time the problem occurred. For example: "I was checking out a document to the file system," or "I was deleting a field from a file cabinet." Note when the behavior started and anything that may have happened before the problem occurred. Even a seemingly minor event may be associated with the problem. For example: "The server had Microsoft updates applied last evening and was rebooted," or "We updated our anti-virus software." If you’ve consulted the customer forums and searched our FAQs and still need assistance, the quickest way to contact DocuWare Support is to submit a support request via the DocuWare Support Portal. This is the preferred method for you to gain support for DocuWare. As you fill in the Support Request form you will be providing information that will allow us to better understand your issue. Your request appears in our coordination lists and video status boards in the Support Department in real time. 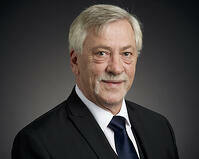 Phil Robson is the Senior Director of Support Americas at DocuWare. He is responsible for all Support operations in North and South America. An avid fisherman he can be found at the end of a fishing pier by day and at the business end of an astronomical telescope at night.